After rounding Punta Mala we spent a few nights on the Peninsula de Azuero and bumped into friends we’d met back in Escudo de Veraguas. Barney and his family were traveling the same route and schedule as us and we spent a couple nights in a calm bay on the southwestern side of Isla Cebaco together. Barney has sailed all over the world, his wife, Mel, is a fantastic cook, and their daughter, Faa, is a well-traveled and experienced dive instructor – way more mature and accomplished than I was at 18-years-old. Mel and I were lamenting the lack of fresh herbs in Panama; we’d both been trying to grow some on board, neither of us with much success. She’d bought a bunch of what she thought were jalapeños but what turned out to be teeny sweet peppers so I gave her half the bag of habaneros I’d bought in Panama City. The next day she shouted over to me as I passed in the dinghy. “I have your peppers!” I was a bit confused. I told her they were hers to keep, I hadn’t lent them to her for the night. But she waved me over and tossed me a small jar. Homemade hot sauce! And Mel is from Thailand, so her hot sauce is proper hot. During our time in Cebaco she also gave us a recipe for Matt’s favorite Thai dish, three-flavor fish (which I promptly forgot because I was busy eating her spicy chicken with pineapple) and a packet of spices for Laab, or meat salad (ie: the best kind of salad). She also makes a mean fish cake, which I’ve since been trying to recreate on Tamata. 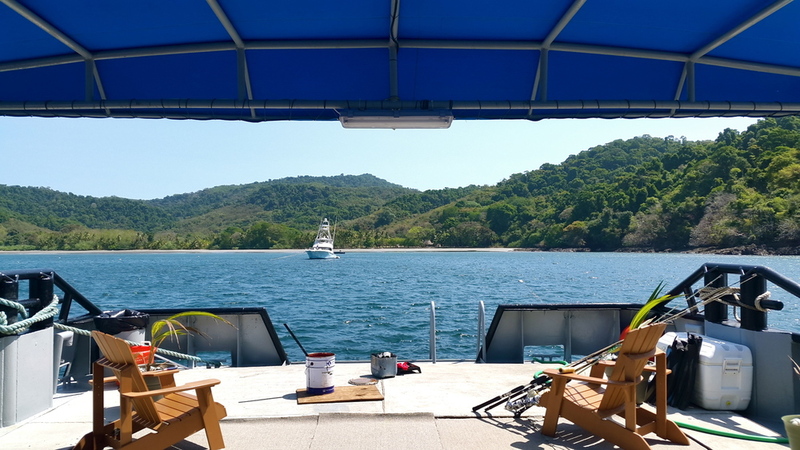 Besides the food and story swapping, there were two other constants during our time in Cebaco Bay: a steady northeasterly wind racing through the gap between hills, and a big, black barge moored in the southeast corner. The barge was seemingly there permanently, but surrounding it on smaller mooring balls was a pod of baby-blue-hulled, black-tinted-window motor boats that were kept immaculately clean when they weren’t buzzing in and out of the bay. I sort of just assumed it was a drug-running operation until I remembered that we were only 35 miles from Hannibal Bank, a legendary Central American fishing spot where the Pacific rises sharply from 1300 meters to just 17, attracting tuna, sailfish, marlin, wahoo and other pelagic fish. This was Cebaco Bay Fishing Club, an understated fishing “lodge” where guests could fish all day and return to drink cold Balboas and grill their catch on a big barbecue on the barge’s deck in solitude, accompanied only by the roars of howler monkeys and the slapping of baitfish on the surface of the bay’s prairie flat water. No gourmet restaurant. No infinity pool. No masseuse. Just fishing and beer. (Which I realize is about as redundant as saying “just skiing and snow!”) Anyway, we learned that you could buy ice and diesel and that the hose leading from the nearby rocks on shore was transporting fresh water from the island’s natural spring for drinking, laundry, showers, and washing down the boat. Jose, the manager, was a quiet guy with a shy smile. There were no guests at the time, so he showed us around the boat. He also loaded us up with ice and scheduled a time for us to come alongside and fill up with very expensive diesel. The covered deck was inviting and offered a few minutes of refuge from the wind. Apparently the Panamanian Aeronaval thought so, too. Eight of them arrived on their black speedboat in full camo the next day and spent the afternoon listening to music, napping in the hammock and playing dominos in the shade. Josh and Kim arrived on Kuhela that day, too, and the four of us enjoyed fresh fish for dinner each of our remaining nights there. I know I keep talking about how great the places we visit are, but really, we had it pretty good in Cebaco Bay. If the surf hadn’t picked up at Santa Catalina over on the mainland, we likely would have stayed put. But it did. So we didn’t.